Mt. Gox Files For Bankruptcy; Nearly $500M Of Bitcoins Lost : The Two-Way The bitcoin exchange says it was hacked. Investors likely have little chance of getting their money — real or virtual — back. 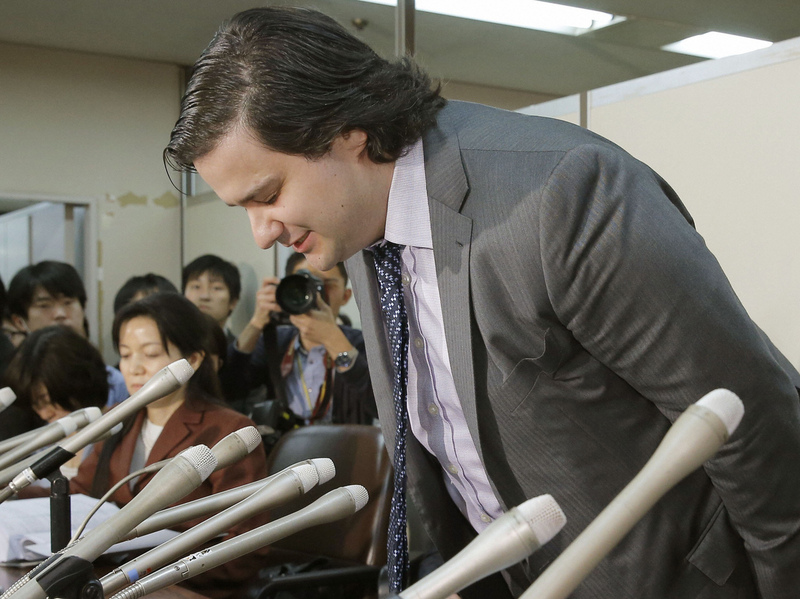 A bow and an apology: Mark Karpeles, CEO of Mt. Gox, was contrite at the start of a news conference in Tokyo on Friday in which it was announced that the firm has filed for bankruptcy. The scope of the collapse of what once was the world's largest bitcoin exchange took shape Friday when Mt. Gox filed for bankruptcy protection in Japan, saying it had lost track of nearly $480 million worth of the virtual currency. "Wearing a suit instead of his customary T-shirt," Reuters reports, Mt. Gox CEO Mark Karpeles "bowed in contrition and apologized in Japanese at a news conference at the Tokyo District Court, blaming his firm's collapse on a 'weakness in our system,' but predicting that bitcoin would continue to grow." According to The New York Times' DealB%k blog, Mt. Gox says "it might have lost 750,000 of its customers' coins, essentially all of them, in a hacking attack." Mt. Gox also lost about 100,000 of its own bitcoins. "Mt. Gox's missing 850,000 bitcoins are worth $473 million," Bloomberg News notes, "based on current prices shown on the CoinDesk Bitcoin Price Index." Mt. Gox ceased operations earlier this week. Other major bitcoin exchanges condemned Mt. Gox for what they said had been a "tragic violation" of its users' trust. According to DealB%k, investors who "stashed money on the Mt. Gox platform" have said they have little hope of recovering their funds. Still, the blog adds, the bankruptcy filing means a supervisor will be named "to develop a restructuring plan, and will also be responsible for handling any payment of claim distributions to its creditors. That process could take [from] several months to several years." "Those in the industry said Mt. Gox ceased to be the exchange of choice about nine months ago as competitors such as Bitstamp gained prominence. By the start of this year, Mt. Gox was considered a diminished player due to concerns about its technology and safety.
" 'It was obvious there was something really bad going on there for nearly a year. They were processing withdrawals very slowly and generally being very opaque about what was going on,' said Mike Hearn, a bitcoin developer based in Switzerland." -- The BBC calls it "a new kind of currency." But, the news service adds, "it may be best to think of its units being virtual tokens rather than physical coins or notes. However, like all currencies, its value is determined by how much people are willing to exchange it for." -- Planet Money's Adam Davidson tried to explain to Comedy Central's Stephen Colbert just what a bitcoin is and warned Colbert to avoid the currency. "Never buy a bitcoin," Adam advised. "There's absolutely no way to know what it's worth in five minutes, let alone five years." -- All Tech Considered has weighed in on "what this b-word means, where it came from and why it just might matter."